Find your perfect carpool buddy! Carpool matching can take the “what if” out of carpooling, by letting you find the right commute for your needs. You can find other riders that fit your needs, and even set the financial arrangements up front. A great resource for carpooling is Front Porch Forum, a free community-building service that helps neighbors connect by providing a forum specific to your neighborhood. To get started, you can post or look for ridesharing neighbors in your community. Looking for other ways to start or join a carpool? Email your co-workers, or post on your employer’s bulletin board. Cut 50% of your daily commute costs! By sharing a ride, your carpool buddy can take on half of the cost of gas. Calculate your savings with the Go! Vermont Commute Calculator. By sharing rides, you can reduce wear and tear on your vehicle. Less cars on the road, means less carbon in the air. Registered Go! 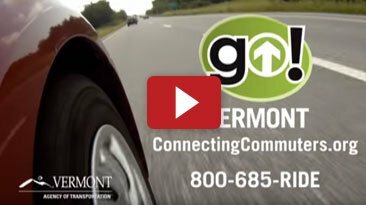 Vermont users qualify for the Guaranteed Ride Home Benefit, so you’re never stranded when you need a ride. Looking for resources or ideas on how to help friends, family or co-workers choose Carpooling as a more efficient way to travel? Our Resource Toolkit provides free carpool resources, including helpful tips on how to get started. As another benefit of joining Go! Vermont, this pass allows you to park in specially designated parking spots. Just call or e-mail us and we’ll be happy to send one along. Looking for a Park & Ride? Vermont has 27 State Park and Ride lots and 21 Municipal Park and Ride lots located throughout the state. Visit parkandrides.vermont.gov for detailed information on each location. A free community-building service, specific to your neighborhood. Post or look for ridesharing neighbors in your community.